When considering the purchase of a new smartphone, we generally assess features such as battery life, graphics performance, speed and camera quality. By and large, design should also be aesthetically pleasing, and the device comfortable to hold while in use. For those that work in harsh environments like construction sites, a device must also withstand the elements. 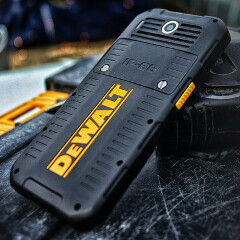 Whilst there's no shortage of rugged handsets on the market already, DeWalt has unveiled a tough device that looks more like toolbox fodder than a new smartphone. The DeWalt MD501 is IP68-certified, so can hack a 30-minute submersion in up to two meters of water without issue. It can also cope with extreme changes in temperature, ranging from -20°C (-4F) all the way up to 60°C (140F). Aside from its brawn, though, the DeWalt MD501 is not too bad a smartphone when it comes to tech. specs. The 5-inch display is an HD offering (though only 720p resolution), and is toughened by Corning's Gorilla Glass 3. Under the hood sits MediaTek's quad-core MT6735 SoC clocked at 1.3 GHz, allied to 2 GB of RAM. Elsewhere, there's 16 GB of expandable storage space, 5- and 13-megapixel cameras on the front and back respectively, and the 3020 mAh battery is supportive of Qi wireless charging. Along with 4G LTE, the MD501 boasts all of the usual connectivity including Wi-Fi, Bluetooth 4.0 and NFC, and arrives in the UK at a cost of £379 ($543). Software-wise -- though Android 6.0 Marshmallow out of the box would be favorable -- the MD501 instead gets Android 5.1 Lollipop. Of course, the specs could be better. But given the target audience of builders and engineers, DeWalt knows that folk within these fields tend to require a handset that can hold its own, rather than one that boasts a strong score on AnTuTu. Though it doesn't appear that the DeWalt MD 501 is available to purchase just yet, interested parties can sign up to the firm's mailing list at the source. IKR, if so i'm sold lol. Sonim XP 7 is a better all around device. And yeah with the XP 7 you can use it as a hammer i had it for 4 months in store and was trowing it in the air so its fall on the screen and never its broke. Sonim also cover phone for 3 years warranty including physical damage and liquid damage. I didn't know april fool's day articles will last until april 19. I can forgive every specs mentioned but a quadcore mediatek processor for $500? Could have at least used a sd 615 for the chip right? You do realize the selling point is "Rugged" here right. It's not gonna have the latest specs. Just good enough tough work environment. Only thing that would make it better is a huge logo on the back, maybe next time. These "tough" phones always have mediocre specs. A heavy duty "tough" smartphone with all the latest specs would be like $1200. Not to mention people who a phone that tough for work. don't care about crazy specs. Nice to see all the heavy-duty tool makers are jumping on the Android platform. First CAT and now DeWalt, next up Black & Decker? I'd steer clear of the Ryobi phone if one ever came out. Or maybe the Harbour Freight brand Chicago whatever. You'd use the phone once and then throw it away and buy another one. Wow someone here knows their tools. 100% agree. Especially harbor fright Chicago tools - that stuff is junk. Naaaah! I expected it to have a grinder too. Fail. 500$ for that piece of crap? Gorilla glass 3 in 500$ phone in 2016? Meanwhile moto has a phone you cant actually break the screen unless you try it hard. I bet you this POS will break down after few drops on concrete. All depend on the thickness of the gorilla glass 3. Sonim XP7 only have gorilla glass 2 and i can use the screen as a hammer on nail and its wont break. Even trowing it 5-10 time a day on concrete its did not broke and had minimal scratch on it. "piece of crap" because it doesn't have the latest specs? You serious? I worked at Home Depot for almost a year. They use smartphones in their stores for assisting customers and just doing work. I can see them switching to theses. They could use them to help sell DeWalt tools too. Might even offer the phone for sell in the store. The fact that the pics show android 4.4 is definitely quite disturbing.